Patriots still Super Bowl LII favorites despite losing Julian Edelman for the season. They may have lost their top wide receiver, but the New England Patriots haven’t budged on the Super Bowl LII futures market. They’re still the +325 favorites at press time despite losing WR Julian Edelman (98 catches, 1106 yards last year) to a torn ACL. Edelman will miss the entire 2017 season, which starts September 7 when the Patriots host the Kansas City Chiefs (8:30 PM ET, NBC). Bet on football at Bovada and get a free 100% bonus up to $250. 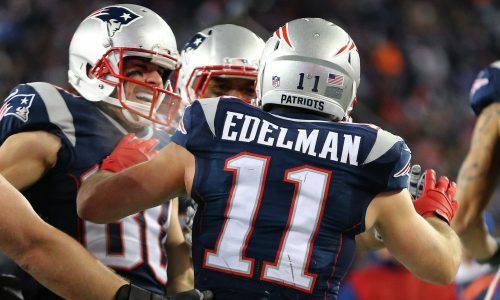 Without Edelman’s services, the defending Super Bowl champions will be relying on newcomer Brandin Cooks (78 catches, 1173 yards for New Orleans) to be their top wideout. Cooks came over from the Saints in March; he was sixth among NFL receivers last year at 10.0 yards per target. Chris Hogan (38 catches, 680 yards) should also see some more playing time with Edelman on injured reserve. On the defensive side of the ball their top-ranked defense from last season will welcome Pro Bowler Stephon Gilmore to the secondary and one could easily argue that the Pats appear to have a better roster than last season’s 14-2 club. The Green Bay Packers (+900) and Oakland Raiders (+1000) are the top contenders to New England’s crown, at least according to the NFL futures. The Atlanta Falcons, who nearly beat the Patriots at Super Bowl LI, are available at +1200. The Falcons have almost all their key players coming back for 2017, and they’ll be playing in the new Mercedes-Benz Stadium this year. Get your up to date NFL futures odds at Bovada here.